a sign it's time to go to bed. I don't know if this is one of your strategies for playing Words with Friends, but there are times (that happen quite often, to tell you the truth) when I just try making up words so I can score the biggest points instead of actually thinking of real words from the seven letters I'm given. And apparently, this strategy also sends some messages to the user as well. Obviously, "thebed" isn't a real word. I was actually thinking it would be pronounced "thebe-d" as in the past tense of "thebe." Which isn't a real word, but it does remind me of the bird called a grebe (I know that word is real thanks to high school biology) and the word thieve. But when I looked at it again, it looks a lot like the words the and bed put together. 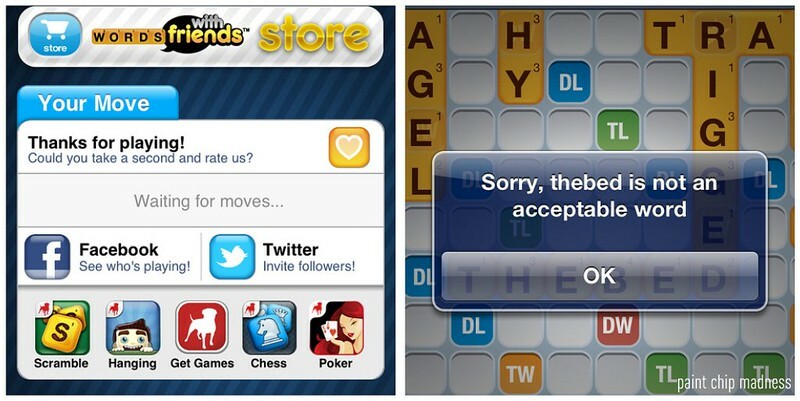 Obviously Words with Friends was just trying to tell me to go to bed already, right?